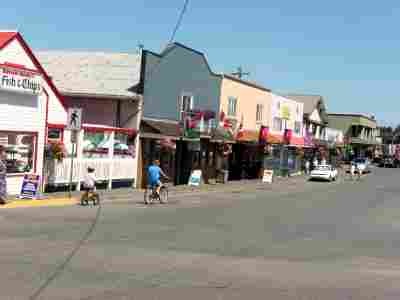 Information: - This town, on Vancouver Island, was saved by a unique idea. 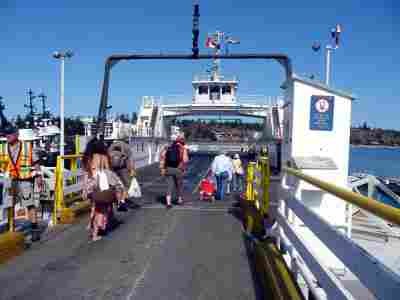 Access: - Easiest access is by ferry from Thetis Island. Comments: - This is a town with a unique gift for visitors - beautiful murals. 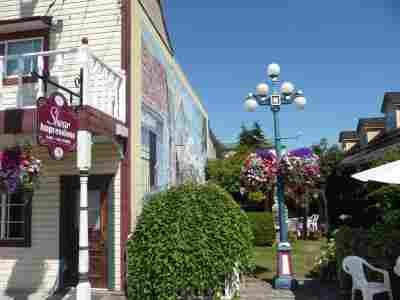 CCThis is a delightful small town on the eastern shore of the 'mainland' of Vancouver Island. 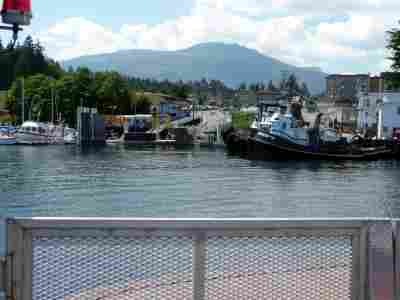 The town docks are often too crowded for visiting boats to tie up, so we would suggest tying off at the public dock in Preedy Harbour on Thetis Island and taking the ferry across to Chemainus. 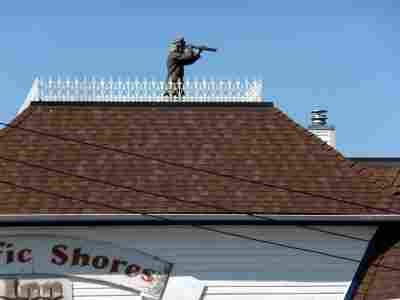 This is the town that was saved by a good idea and townsfolk willing to back it up. CCWe cruised into the harbor and radioed for information regarding the public dock - "no room." 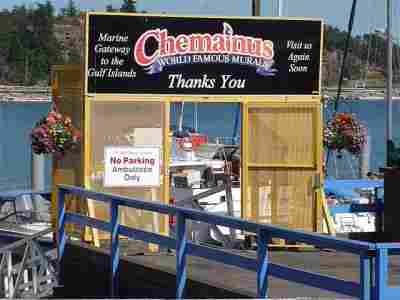 We were told that this is normal at Chemainus since there are many commercial boats that use the small public dock. Our C-Dory friend, Barry, was anxious to introduce us to this, one of his favorite towns in the islands. 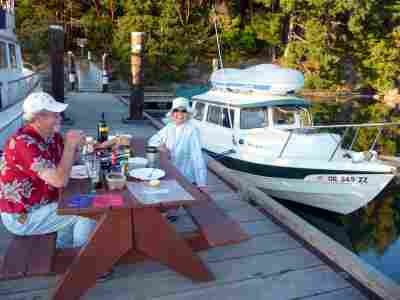 Undaunted, we decided to make the short cruise back easterly to Thetis Island, tie at Telegraph Harbor Marina, stroll the 10-15 minute walk to the ferry landing and take the ferry to Chemainus. On the way east, we noticed that the ferry landing is in Preedy Harbour, and that there is a public dock very close to the ferry landing. We cruised into Preedy Harbour, and sure enough, there was the public dock and it was empty! 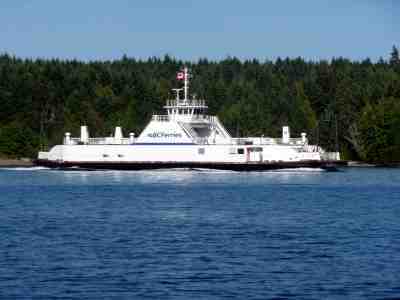 Just as we were tying off, the ferry to Chemainus entered the Harbour. We secured our boats and hopped on the ferry. Hmmm - we took a boat to take a boat! 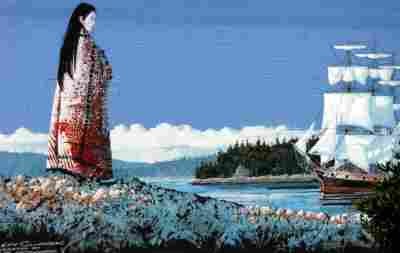 CCNative people had lived in this area for thousands of years, hunting, fishing and gathering local foods. The name of the town comes from a Native shaman and prophet, "Tsa-meeun-is" (Broken Chest). He survived a massive wound in his chest, in his youth. His spirit was so great he became a powerful chief of his people, and they adopted his name for their town. 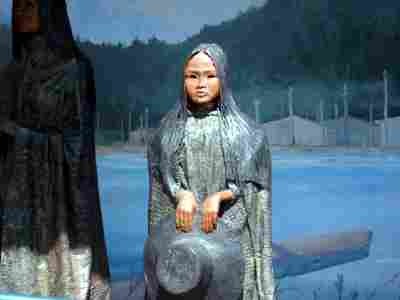 CCChemainus was a mining, fishing and logging town, founded by Europeans in 1858. The railroad arrived in the 1880's and shortly after the turn of the century there were 600 people in the town, many were migrant workers from China, Japan, India, who mingled with the founding Scotch and Germans. The largest covered-in sawmill in North America provided the economic base for the community. 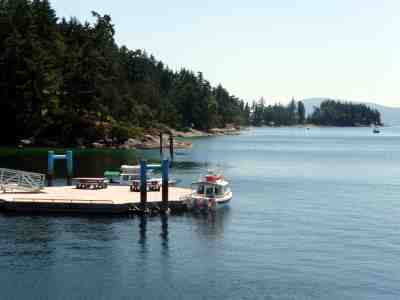 The port was one of the first developed on the Pacific coast of Canada. 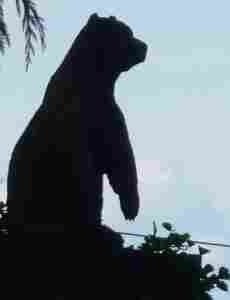 However, the constant in economics is change. The mines and forests were slowly depleted. 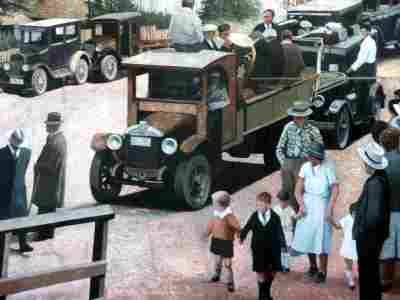 With the loss of the natural resources, jobs disappeared and eventually the mill closed in 1983, after operating for 120 years. Almost 700 people were unemployed, in a town population of under 4,000. The town council had, the year before, begun a downtown revitalization project and that now looked doomed. Most thought the town would wither and die. CCIt was then that local businessman Karl Schutz came up with a good idea. 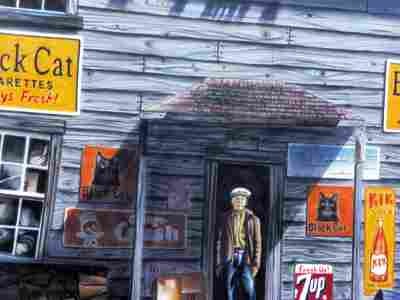 Continue to beautify downtown and add outdoor murals to commemorate the town's history. Townsfolk rallied and formed the Festival of Murals society to foster and preserve his idea. 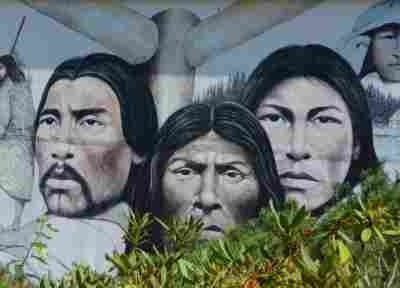 In 1981 there were five murals. 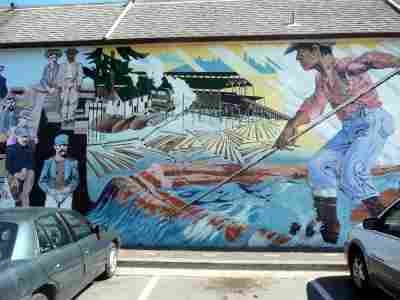 They were the first town to generate tourism using outdoor murals. Townsfolk made it work. 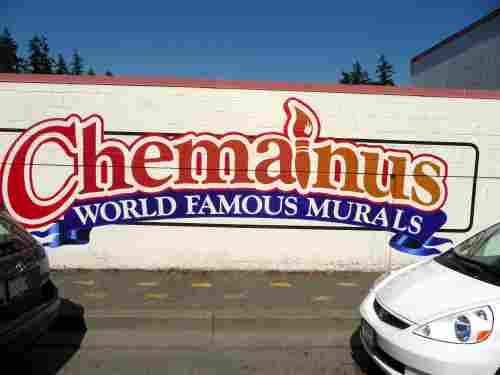 Today there are almost four dozen beautiful murals decorating the walls of downtown Chemainus. 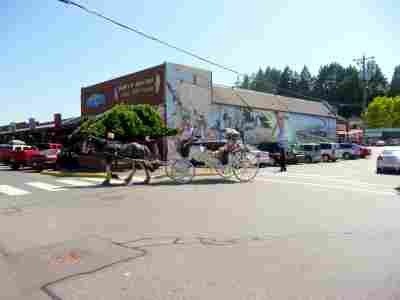 The murals (and the town) are famous today, and hundreds of thousands of visitors come annually. There are over 300 business in town and a population of about 5,000. 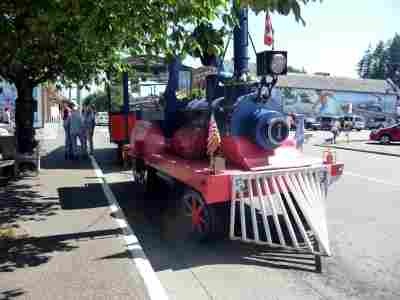 This is a town saved by a good idea and people who supported it - "The Little Town That Did." CCSometimes it is difficult to admit that you are a tourist. But, unless one succumbs to that oft-maligned term, you might miss out on the pleasures of visiting new places. 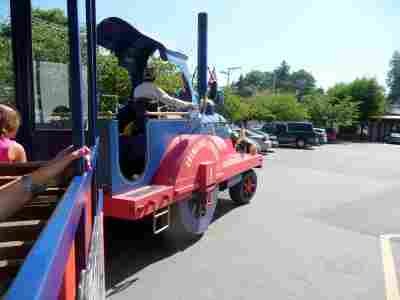 So, happy tourists, we climbed aboard the 'train' to tour the town. The knowledgeable guide filled us in on the background of the murals and the 'tour' was excellent. CCIt was a tough job working a log out of the forest. 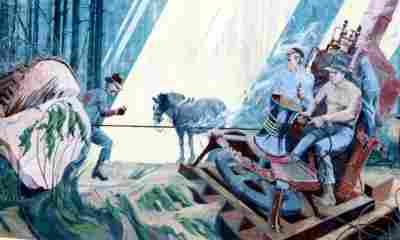 John Dolbeer invented the steam donkey in 1882, and the man controlling the lever in this painting (after a 1902 photo in the forest outside Chemainus), Herbert Olsen, later became noted for his worldwide lumber interests. 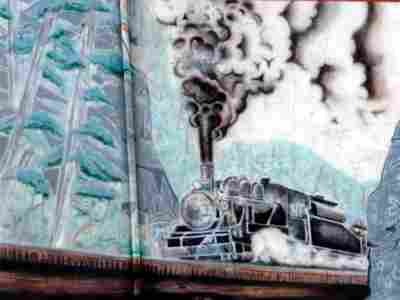 CCThe mural depicts the 'boomman' sorting logs for the mill - a slippery and dangerous job. 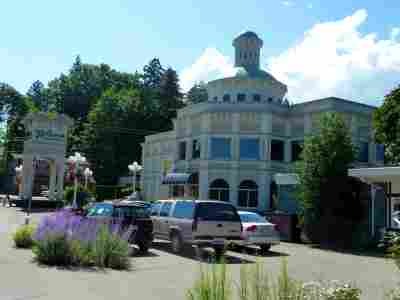 CCThe first, last, and longest lasting rail logging operation in British Columbia supplied the mill at Chemainus. 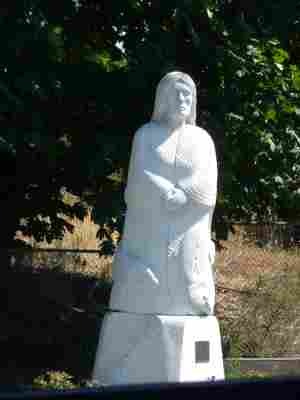 CCHong Hing was known to all in early-day Chemainus. He sold groceries, chickens and secondhand goods and also was the town bootlegger and had a gambling business in the back of his store. CCUnfortunately, I didn't get a photo of the other original mural. 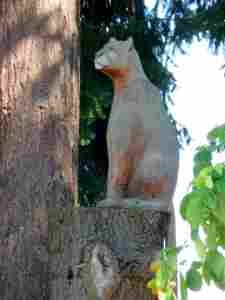 But there are many more to view, all over town.